More on the politics of accreditation in the accreditation section below. And more on the politics of testing in the testing section below. Via The Atlantic: “Alabama House Speaker Michael Hubbard was automatically removed from office Friday after a jury convicted him on 12 felony public-corruption charges, adding to the state’s extraordinary political crisis.” I haven’t seen the ed-tech press cover this story, even though one of the charges he faced involved a contract with the ed-tech company Edgenuity. So odd. Via The Washington Post: “Former U-Va. law student files suit challenging federal sexual assault directive.” “John Doe” was accused of and found responsible for sexual misconduct and now is claiming that how universities handle these sorts of charges is unfair and unlawful. “Former Lake Michigan College President Jennifer Spielvogel is suing LMC and its Board of Trustees for alleged wrongful termination,” The Herald-Palladium reports. More on court cases in the sports and testing sections below. “Alaska Legislature Passes Bill to Suspend Standardized Testing,” Education Week reports. Via The Hechinger Report: “Virtual charter schools need ‘bold action’ for change, says national charter school advocacy group.” The organization is worried that virtual schools – pretty much utter failures – are giving charters a bad rap. 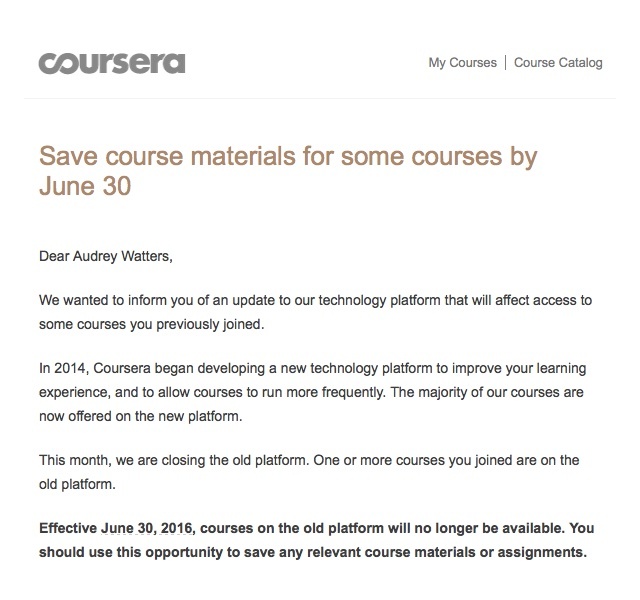 Headline changed from “Coursera’s Update Will Eliminate Hundreds of Courses” to “Coursera’s Update Will Migrate Hundreds of Courses to a New Platform.” Coursera, initially only emailing former students about their old course work, decided finally to blog about its platform change. “Should for-profit crash courses get federal funds?” asks The Economist in an article about coding bootcamps. I mean, for-profit higher ed has such a stellar track record. What could possibly go wrong? For-profit higher ed company Education Management Corp says it will close 22 out of 26 of its Brown Mackie College locations. “Obama’s Missed Chance to Help For-Profit College Students” by Ann Larson. Some solidly uncritical PR posing as journalism in this lede: “Coding bootcamps play a key role in closing the skills gap between the talent companies need and the competencies workers have.” The coding bootcamp Fullstack Academy is launching an investment fund to support its graduates who want to start startups. Always read the fine print, folks. Always read the fine print. And substitute “for-profit higher ed” for “coding bootcamp” as necessary. More on for-profit higher ed in the accreditation section below. From the press release: “Achieving the Dream Launches Major National Initiative to Help 38 Community Colleges in 13 States Develop New Degree Programs Using Open Educational Resources.” More via The Chronicle of Higher Education. “Kickboard Looking for New CEO,” Edsurge reports. Jen Medbery, also the startup's founder, says she's not leaving the company. “Preschool Teachers Earn Less Than Tree Trimmers,” The Atlantic laments. “ALEX Wants to Fill Classrooms Like Airbnb Fills Beds” is an actual headline, and apparently ALEX is an actual startup. “We Shut Down Our Edtech Startup. Here’s What We Learned” by Jawwad Siddiqui, founder of SharpScholar. Anil Dash and Gina Trapani announced they’re closing down their social media analytics product ThinkUp. It’s not an ed-tech startup, true, but it’s important to look at why they say that this beloved product had become unsustainable. That is, major social media platforms like Facebook and Twitter increasingly made it difficult for ThinkUp to work with their APIs. Who owns your data – whether it’s social media or school-related? From Phil Hill: “Update on UC Davis LMS Fiasco: Finishing the term with two partial systems.” e-Literate also posted a student’s take on the school’s LMS outage. “Sakai Is Probably Healthier Than You Think,” Michael Feldstein suggests. Inside Higher Ed has a story on Amazon’s employee training program, once again using the phrase “open source” even though this has nothing to do with open source. Nice branding move from Amazon, who seemingly wants to openwash all the things. Can Michael Horn write a story without using the phrase “disruption innovation”? Via Apple: “Swift Playgrounds App Makes Learning to Code Easy & Fun.” Via Techcrunch: “Meet Box Island, a new iOS game that aims to teach kids the fundamentals of code.” Via the Hechinger Report: “Can a wall-climbing robot teach your kid to code?” Can people please read Seymour Papert before launching their learn-to-code product and/or writing PR for it? Private school startup Klay Schools has raised $16 million from Peepul Capital and Kaizen Private Equity. Flocabulary has raised $1.5 million in convertible note funding from Rethink Education. Sokanu has raised an undisclosed sum from USA Funds for its psychometrics-as-career-matching service. Here’s how Edsurge frames the funding news about EdTechReview, which it suggests might be its “Indian twin”: “ In India, EdTechReview has raised ‘an undisclosed amount of funding in its pre-Series A round from EVC Ventures,’ according to YourStory. The Delhi-based startup currently offers news, reports, product reviews and plans to run a jobs board and conferences across the country. Hmm...sound familiar?” Um, yes, it sounds like Education Week, The Chronicle of Higher Education, ASCD, Inside Higher Ed, ISTE, EduKwest, Make Magazine, CourseTalk and/or many, many, many other education organizations and publications, although to be fair not all of these take venture funding to promote ed-tech products. Homework help site (or if you prefer the company’s branding “social learning platform”) Brainly has acquired OpenStudy for an undisclosed sum. City & Guilds has acquired Digitalme and Makewaves in order to form a new digital credentialing business, Doug Belshaw reports. More via Digitalme’s Tim Riches. There hadn’t been any education IPOs this year until China Online Education Group’s this week. The stock’s now trading at $20.26 a share. “Some Observations on Kahoot!” by Bill Fitzgerald. The company was profiled by The New York Times earlier this year, but Fitzgerald looks closely at privacy issues that weren’t really addressed in that story. “University of Calgary pays ransom after attack on computer systems,” The Globe and Mail reports. The Online Learning Consortium finds students prefer online learning (contrary to other surveys that find they do not. Weird). Is the answer to a headline in the form of a question always “no”? “U.S., Global K–12 Markets for Personal Computing Devices Slow,” says EdWeek’s Market Brief, drawing on research from Futuresource Consulting. Funnily enough, a different research firm has a different prediction: “Global classroom wearables technology to grow,” says ECampusNews, drawing on research from Research and Markets. Via Salon: “It’s official – *the internet is making us dumb*: The more you read online, the worse you write.” No, Salon. You’re dumb. “Half of teachers comfortable with tech, but most use it for testing.” Ed-tech uber alles. Hot takes on soft skills from the guys at Education Next: “Time to Flit the Grit” by Russ Whitehurst. “Russ Whitehurst Throws Cold Water on the Grit Craze, But Is the Water Too Cold?” by Jay Greene. “What ‘Hamilton’ and Its 11 Tonys Say About Grit and Privilege” by Andy Smarick. From a press release from the University of Leicester: “Who’s the best-equipped superhero? Student research settles ‘superpower showdown.’” But which superhero has the most grit, Education Next?